Silver-Plated & Hand-Cut Crystal Liner. Robably, German, this magnificent Jugenstil centerpiece was made circa 1900 - 1915 and features a very attractive geometric design, typical for German Art Nouveau movement. Hough unmarked, it is clearly in the style of the well-known WMF Company. The high quality metalwork is in perfect original condition, as well as the original finely hand-cut crystal liner. Please refer to photographs, as they are part of the description. We guarantee the authenticity of all items to be as represented. Ashville Fine Arts Gallery specializes in a variety of fine art, antiques, jewelry, collectibles and rare finds. If you haven't seen something that interests you or that you collect, please visit often and check our ever expanding inventory. Make a best effort to provide a fair and descriptive condition report. Examine the photos attentively, as they are an integral part of item descriptions. Domestic & International Customers are Welcome! All items are carefully packed and insured. 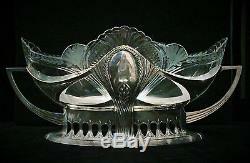 The item "A Grand Jugenstil Silver-Plated & Hand-Cut Crystal Liner Centerpiece, Ca. 1900" is in sale since Tuesday, August 30, 2016. This item is in the category "Antiques\Periods & Styles\Art Nouveau". The seller is "ashvillegallery" and is located in New York, New York. This item can be shipped worldwide.